Learn more about the pioneering explorations and cultural adventures of Don Bernardo de Miera y Pacheco, when Spanish colonial art historian Felipe R. Mirabal speaks on the scientist, explorer, cartographer and santero. Mirabal’s lecture, “Defining the Colonial World: The Explorations Don Bernardo de Miera y Pacheco,” is at 2 pm, Sunday, Aug. 14, in the History Museum Auditorium. The lecture is free with admission; Sundays are free to NM residents. Mirabal has worked with institutions including the University of New Mexico and the Archdiocese of Santa Fe and has served as a curator at El Rancho de las Golondrinas Living History Museum. His areas of expertise include the art history of Spanish New Mexico and the Spanish Catholic experience during the colonial and Mexican periods. Miera y Pacheco (1713-1785), he says, “is often unjustly referred to as colonial New Mexico's `jack-of-all-trades’ or wrongfully as a `Renaissance man.’ He was, in fact, the embodiment of the term `polymath’—a person of encyclopedic learning who was proficient in astronomy, cartography, mathematics, geography, geology, geometry, military tactics, commerce, husbandry, oenology, metallurgy, languages, iconology, iconography, liturgy, painting, sculpture and drawing. Mirabal has constructed a biography of Miera y Pacheco and created a database of the maps he drew of Spain’s northern colony and artwork he created, including a monumental stone retablo built in 1759. That altar screen was once the main altar of the Capilla Castrense, the military chapel built on the south side of the Santa Fe plaza in 1761. The chapel was built to serve the soldiers and families of the presidio. It remained the military chapel until 1859 when the altar screen was dismantled and reassembled in the sanctuary behind the St. Francis Cathedral. In 1939 it was moved to the sanctuary of the newly built Cristo Rey Church on Canyon Road where it remains today. Mirabal’s research includes historical civil and ecclesiastical documents, a genealogical study, Miera y Pacheco’s maverick geometrical and scientific data, archaeology, artistic foundations, iconographic analysis and an examination of several unpublished artworks. 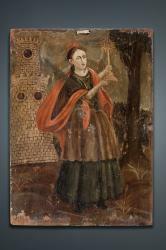 Download a high-resolution image of the Santa Barbara retablo by clicking on "Go to Related Images," below.